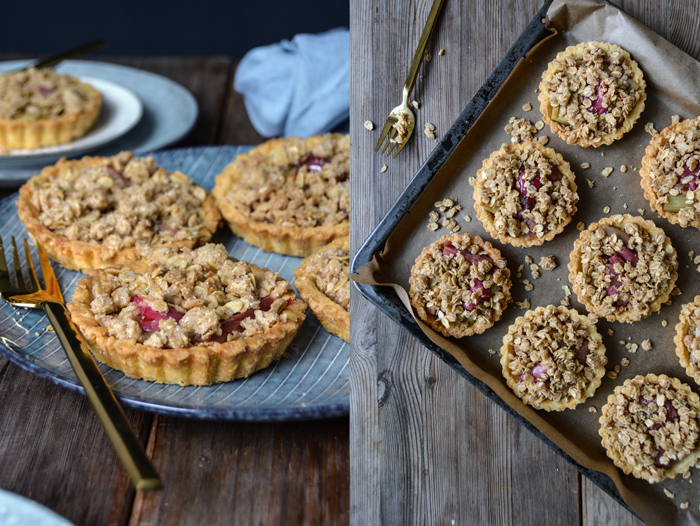 The combination of rhubarb and cinnamon crumble is so perfect that I dare to call it one of my favourite baked sweets. It’s sweet, fruity-sour, and buttery, what more could I ask for? I could add oats, which I’ve never done before for some reason, so I gave it a try and the result was extremely pleasing. 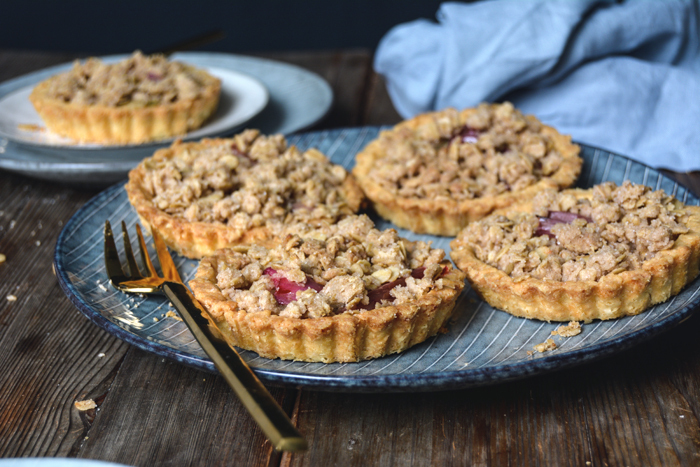 The first bite through the crunchy aromatic crust and soft fruit gave me the feeling that home-baked sweets are simply the best. The past few days were a little rough and rocky and I often wished I had two Meikes to sort out all the tasks and problems piled up on my desk. Late night work led to sleep deprivation and a paranoid me, worrying that I wouldn’t manage to finish everything in time. I call myself quite disciplined, I can work hard, but luckily, I also know when to pull the brake. It was a bright and sunny afternoon and I started to feel like I could see the light at the end of the tunnel – although not all problems were solved yet – but I decided to close my laptop. Trying not to think too much, I grabbed my bag and jumped on my bike. Cycling through springy Berlin and enjoying the bumpy ride over cobbled roads put a smile on my face as I saw nature’s leaves and blossoms taking over the city again. I stopped at a café for a creamy cappuccino that felt like the best coffee I had in a while, and leafed through a cheesy magazine. Life can be perfect and sometimes it’s so easy to get there, all you have to do is forget about your duties for a little while and follow whatever you’re mood calls for. Preheat the oven to 200°C / 400°F (preferably convection setting). 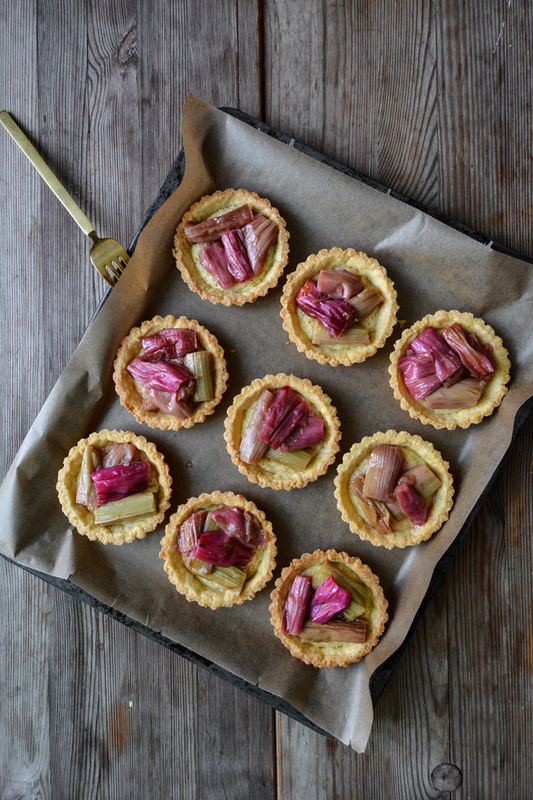 For the filling, add the rhubarb and sugar to a large baking dish and toss to combine. Bake for about 25 minutes or until soft but still in shape. 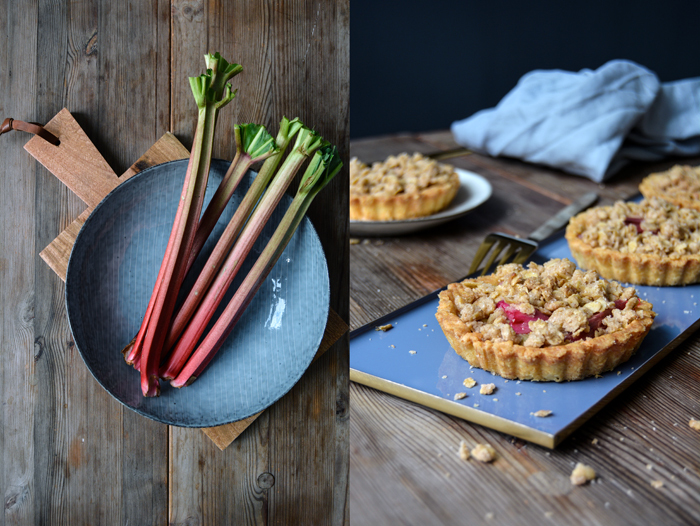 Set the rhubarb aside and let it cool completely. For the pastry, in a large bowl, combine the flour, sugar, and salt. Cut the butter with a knife into the flour until there are just little pieces of butter left. Continue with your fingers and rub the butter into the flour until combined. Add the egg yolks and continue mixing with the dough hooks of an electric mixer until you have a crumbly mixture. Form a thick disc, wrap in cling film, and put in the freezer for 10 minutes. Butter 10 (10cm / 4″) tartlet pans and dust with flour. Line a baking sheet with parchment paper. Divide the dough into 10 equal parts. Roll out the 10 pieces of dough between cling film into 12 cm / 4 1/2″ circles. Line the tartlet pans with the pastry, push the dough into the pans, and prick with a fork. Bake for about 12-15 minutes or until golden, bush the dough down with a fork if it bubbles up. 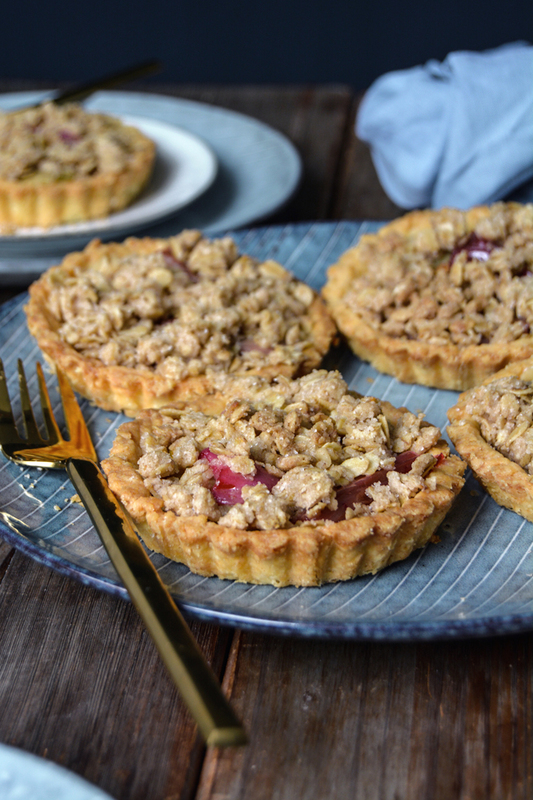 Take the tartlet pans out of the oven and let them cool for a few minutes. 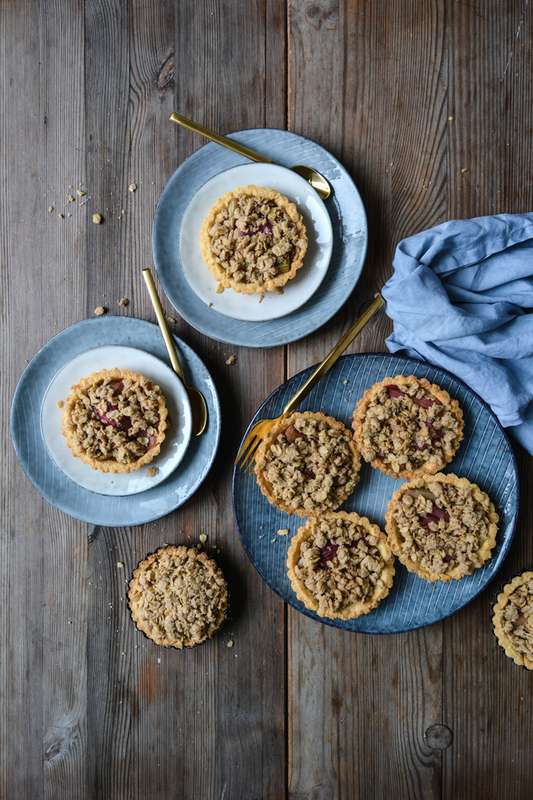 Using a metal skewer, loosen the pastry shell gently along the rim and turn the tartlets out onto the lined baking sheet. 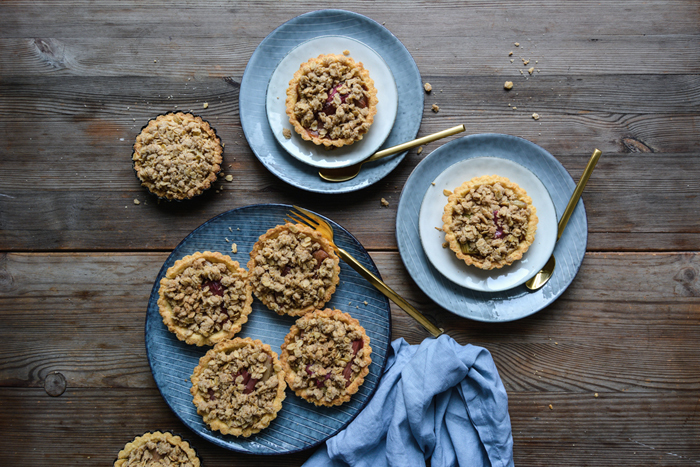 For the crumble, combine the oats, flour, sugar, and cinnamon in a medium bowl. Stir in the melted butter and mix until combined and crumbly. 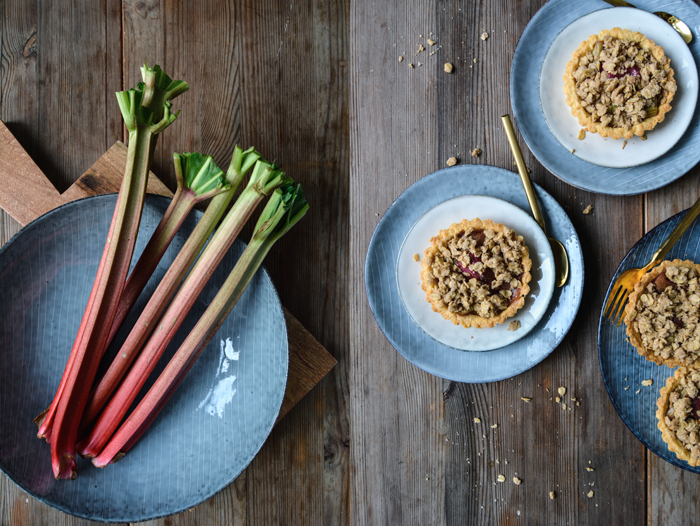 Divide the rhubarb among the tartlet shells, sprinkle with the oat crumble, and bake for about 15 minutes or until golden brown. These look absolutely delicious. Thank goodness you didn’t add strawberries. 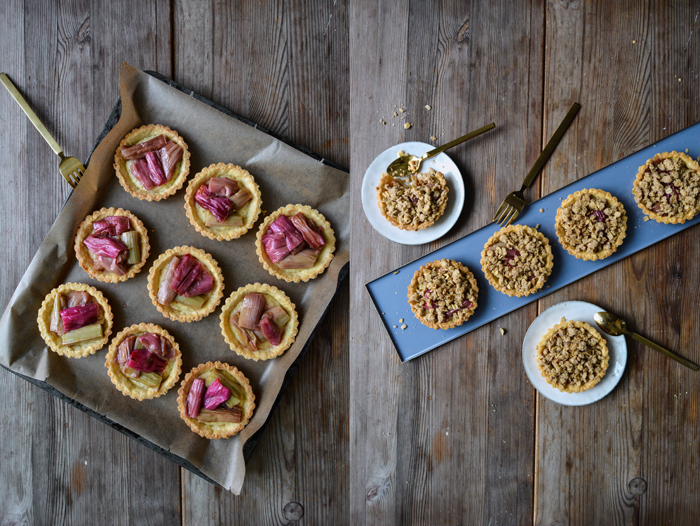 I think rhubarb is wonderful all on its own. Thank you June! I love the sourness of rhubarb and the sweetness of strawberries, but I also prefer to enjoy them on their own.